War, what is it good for? Filling your mouth with deliciousness. Warning: What follows is a highly biased (I love both Rivertown and Irish Reds) slightly-dramatized review. This beer pours out of the bottle a fiery blood red color topped off with 2 fingers of head that hangs around like men on the gallows. The smoke of canon fire overwhelms my nose. This thing is smooth like a hot sword cutting the head off some invading barbarian. Those fires of war come back and fill my mouth as well, when War is on the march there is no escape. The sweet savory flavor of victory over ones enemies follows the smokey flavor of the bullets which took down that enemy. Seriously though, this is a limited time release. I scored my bottles at the Rivertown Tap Room, which if you haven’t been to yet you should REALLY check out. From what I’ve heard the bottles should be hitting the shelves of better beer sellers in the next week or two, but again for a limited time. This is the second of the four horsemen of the apocalypse and Famine should be up next. 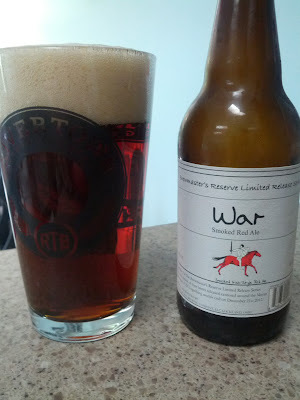 War rode out on a red horse so they made an Irish Red Ale, Famine comes out on a black horse. So maybe we’ll see a Black IPA? But Famine refers to a lack of wheat and barley, so maybe some kind of rice based beer? I dunno, I have no inside information on this. We shall wait and see, when it comes out I will do my best to get you the review as soon as possible! I’m glad to hear a positive take on this. Pestilence was a really, really bad beer. I’ll have to pick up a couple once they get on shelves. Pingback: The Return of My Favorite Local Beer: Rivertown Death!